The Queen’s Beast Series from the Royal Mint of England offers a 10-design series that features each of the 10 heraldic beasts represented in statue form at the 1953 coronation ceremony of Queen Elizabeth II. The sixth of these beasts to feature in the proof range is the Yale of Beaufort. 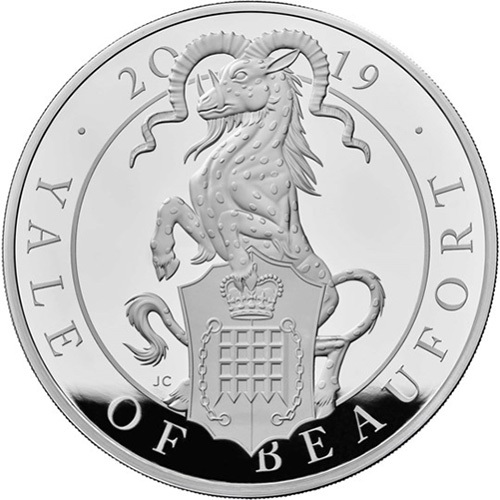 Right now, 2019 5 oz Proof Silver British Queen’s Beast Yale of Beaufort Coin is available to purchase online at Silver.com. Ships to you inside of a capsule and box with a Certificate of Authenticity included! Sixth beast to feature in the Queen’s Beast Series! Mintage limited to 250 coins only! 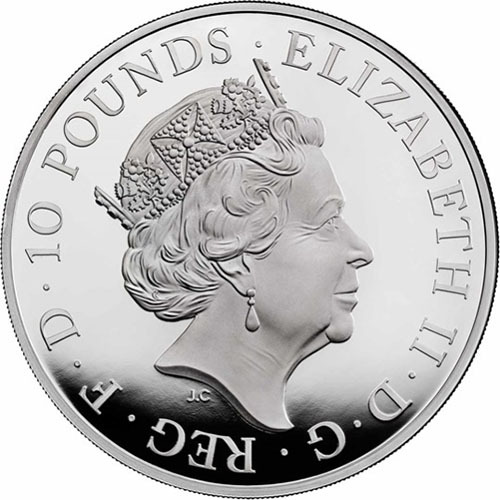 Queen Elizabeth II is found on the coin’s obverse. The Yale of Beaufort is featured on the coin’s reverse. 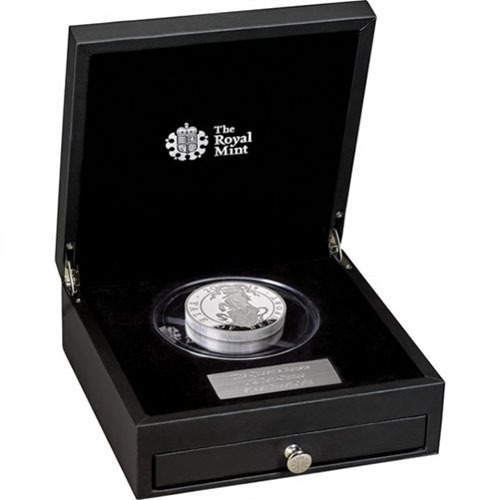 Each of the individual 2019 5 oz Proof Silver British Queen’s Beast Yale of Beaufort Coins comes in beautiful presentation packaging. The coins are individually encapsulated and set within a Royal Mint of England display box. The coins each come with a numbered Certificate of Authenticity. The Proof Silver British Queen’s Beast coins are available with frosted design elements and mirrored background fields. The proof series of Queen’s Beast coins offers four different weights in silver, which include 1 oz, 5 oz, 10 oz, and 1 Kilo weights. The bullion range of coins comes with just two options: 2 oz silver and 10 oz silver. On the reverse of 2019 5 oz Proof Silver British Queen’s Beast Yale of Beaufort Coins is the seal of Lady Margaret Beaufort as carried by her son, King Henry VII of England. The design includes a shield supported by the mythical Yale. Lady Margaret is the mother of King Henry VII, founder of the House of Tudor, and the grandmother of the infamous King Henry VIII. Lady Margaret was the only heir of John Beaufort, the Duke of Somerset. She was an influential figure throughout England’s Wars of the Roses that culminated in her son Henry’s victory over King Richard III and the establishment of the Tudor Dynasty. Lady Margaret survived her son’s reign to see her grandson Henry VIII rise to the throne. The obverse of 2019 Proof Silver British Queen’s Beast Yale of Beaufort Coins bears the effigy of Queen Elizabeth II. Her Majesty’s effigy as depicted here shows her at the age of 89 and was created in 2015 by Jody Clark. If you have any questions about silver coins, please don’t hesitate to ask. You can call us at 888-989-7223, chat with us live online, or email us directly.